I wrote previously about how to adjust the journal table so that dates do not show the UTC values recorded as data changes against a ticket. That previous post was back when the grid was a SLXGrid and control and the code contained an example of how to convert the time based on the server’s time zone. not ideal since your users are likely not in the the same timezone as the web server. 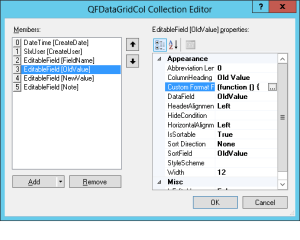 The Editable grid has a Columns collection exposed. Opening this we can see the columns listed in the grid. Each text based column has a Custom Format Property. Since we want to change both the OldValue and NewValue columns so they display the local date/timew rather that the UTC date/time, we will want to modify the Custom Format Function of each column. The workflow is exactly the same for both so I am just going to walk though changing one. When you do it you will need to do it to both columns. 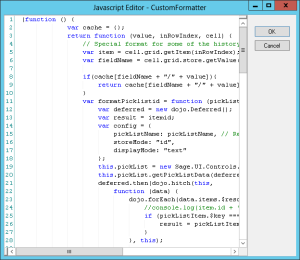 Opening the Custom Format Function of the OldValue column we can see existing code in place. Remember this function needs to be declared before it is first used, so this has to be placed above our case statements. This new function takes the date value and simply adds UTC to the end of it. Then we can case that to the local equivalent date and time using toLocaleDateString and toLocaleTimeString, which for me looks like 01/20/2010 12:35 PM.